What happened next can only be described as a miracle. The desire of the boy was brought to the Make-a-Wish Foundation, who considers the requests of ill children and tries to fulfill them. As the mechanics for the transformation of Miles Scott to Batkid began to fall into place, something else occurred, based in part in our new era of technology. The details and the complexities of making the dream happen began to light up the Twitter sphere, through the Foundation and the participants in the wish. This drew interest from more volunteers, which led to donations of props and performances, which led into the entire City of San Francisco virtually shutting down to create a reality for a little boy. There is joy, hope and a glorified dignity in “Batkid Begins” that we as human beings might have thought was lost, yet was rediscovered in the happy sparkle of the boy, a Foundation, a city and the billions of cyber followers who just wanted to be a part of the miracle. The lesson is Batkid can save us all. This began the story of the wish fulfillment, and how it snowballed. Every decision from the dream granting team at Make-a-Wish was bearing fruit, and the setting up of the situations that would become Miles’ adventure was garnering interest from every quarter of their resources. 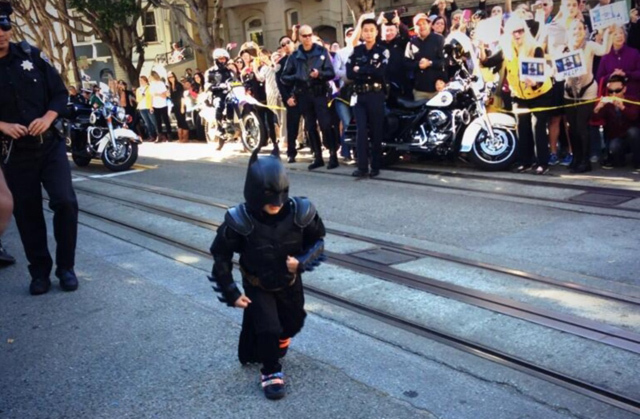 In November of 2013, it all came together for a day in San Francisco – standing in for Gotham City. The Batkid would “save” the city, but at the same time would generate exhilaration for over 100,000 ground participants, and millions more around the world. Director Dana Nachman, with co-writer/editor Kurt Kuenne, has created a documentary that was more than a valentine to the event – it also delved into the well of kindness within everyone that put the wish together, and the mythology of The Batman legacy. All those factors came into play, including the participation of the San Francisco mayor and police chief, and allowed the troubles of everyday life to dissipate for that day in the city, which is communicated so effectively in the film that it’s actually felt. It helped that the situation with Miles was so poignant and innocent. His parents were country folk from Northern California, whose neighbors pitched in on their farm while they had to supervise Miles’ cancer treatments. They were as wide eyed as their son, not just because it was so overwhelming (it was), but because they were so touched that relative strangers would put so much out to make sure their son was accommodated. This was the vital part of the humanity on display in the film, which added to the emotion. 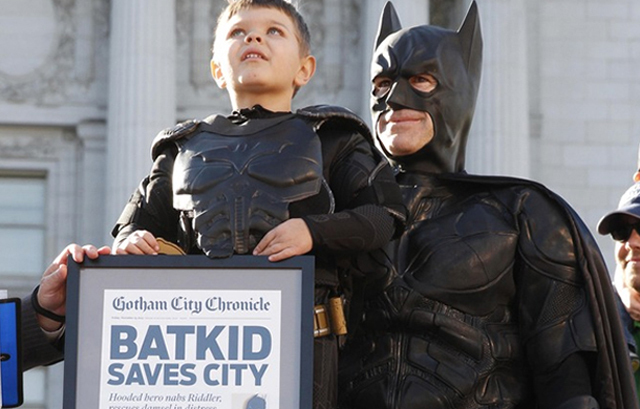 Putting together the Batkid Day was fascinating in itself. Every decision the Make-a-Wish Foundation made regarding the set up of the event took on a magical proportion. Much of the energy of creating the “Batkid saves” scenarios was with the acrobat and actor Eric Johnston, who portrayed The Batman. He and Miles “rehearsed” many of the scenes in the days before the main event, disguising it as a family outing at a gym with a “helpful instructor.” Johnston was able to put Miles through the paces that became the series of events on Batkid Day, and was there to assure him later – as The Batman – that they shared the secret of who he was. It was a for-real superhero act. And finally there is the triumph generated of The Batman character himself. He has morphed so many times through his nearly 80 year run as an icon, and has touched so many souls through the comics and other media. What he represents also became what Miles represented, something that – for the length of reading a comic book or the running time of a movie/TV show or the day of wish fulfillment for a kid – makes us forget our troubles momentarily, and believe in heroes. It had to be The Batman that helped to make the miracle happen, because his legend has allowed so many people to believe. Bottom line, there is a well of tear-inducing delight in “Batkid Begins,” because of an audacious optimism that was produced and the formation of the goodwill ocean that spread so profoundly, and began with a tiny drop of hope in a kid’s dream to be fully alive.